In the previous lesson I talked about some of the benefits of WordPress, and I walked you through the process of installing it on your website. – examples: lesson #32 is a POST. My products page is a PAGE. – Use Posts for a series of blog posts, articles, or other content that you add regularly to your site; use Pages for the pages of your site that don’t necessarily fit into a blog category. – You can use parent pages and sub-pages. – Some marketers claim that Posts are better than Pages for SEO. General: I usually do not use a tagline. Writing: I like to increase the post box to 20 lines. 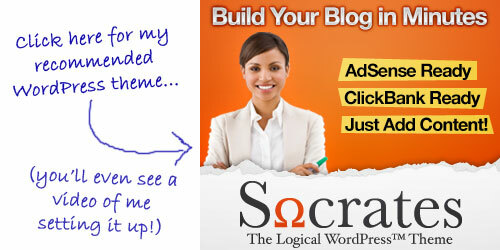 Reading: Choose a static page for your home page if your site is not a blog. Discussion: I moderate all comments. You may or may not want to use the year and month within your Permalink structure. Consider whether it will be better or worse to date your content. Disabling the Visual Editor: I prefer to disable the visual editor under the Users >> Profile settings. I like the basic post box better because it’s simpler and does not interfere with video embed code. 1) Add at least one category and make at least one post, or create at least one page on your WordPress site. 2) Adjust the WordPress settings to best meet the needs of your site. 3) Choose and set up your WordPress permalink structure. In the next lesson we’ll move on to the FUN stuff! What is the best site to learn all about WordPress? Your info is so great. I wish i had this before I had my site built. At least I can go ahead and add and change posts on my site now. Thnks oyu. I have bee slowly working through your tips videos but I do not have your number 33. Thanks for all the tips. I am very grateful. I would like to know whether I should have a webhost to support the word press? WordPress is free. what is the difference with the free blog and paid webhost? You will have a lot more freedom, when you host your blog on your own domain. That lesson will show you what you need to know about webhosting. Thank you very much for all those instructions you have been doing for us. I am new to the affiliate marketing business. I am wondering if you have written a book or ebook with all these teaching contents you have been doing. If you do I will like to purchase it from you. Please advise! May God bless you for what you are doing for us for free. No, all of the Eric’s Tips lessons are not currently in an ebook form. But, you are welcome to revisit these lessons any time you need to. First thank you for the clear, easy-to-follow tutorials at such an affordable (zero) price! However, I missed your Tips #31 and would greatly appreciate your sending it to me ASAP. I cant get the static option to set my home page. Is there something wrong with my settings? Then select the static page. Another great lesson. I am new to WP and can’t wait to get started. I have already learned a good deal from you. Two questions if I may, and I don’t want to get ahead here as you may be planning on covering these topics in the near future. The first on relates to your videos. I have read that you cannot post a video, as you have on a WP blog. The method used should only be a link to a YouTube vid or a vid posted elsewhere on a seperate web site. Yours however is seemless and clean and works perfectly on WP. Also, what format is it please? The second question involves additional software/themes/plugins, specifically, Headway vs.Ultimatum. I am thinking of choosing one of these to work with. Since my background is graphic design you can only imagine my “non- coding” skils. Really, I am leaning towards Ultimatum, but still looking for input. As I wrote, if I am ahead of the game here, I apologize. Any help you can give we would be appreciated. Eric creates most of his videos in Camtasia. You should never purchase anything if is just going to sit on your computer collecting virtual dust. However, at some point, you will need tools to help grow your business. We only recommend that you make purchases when you plan to actually use a tool for your business right away! I am enjoying your Eric’s Tip’s series. This is first class training , well presented and easy to understand. I came upon your training shortly after i had signed up for another coaching program , but I am still following your tips. The information you give out makes it that much easier to grasp the whole concept of affiliate marketing. The website i own (above) has been in operation for a few months and has made no money. I can’t even access my cpanel . Any chance Eric you could have a look at my website and advise me on how to get this site making money. It appears that you are currently monetizing your site strictly as an Amazon affiliate. There’s a lot of competition in the camera niche, so you may want to focus your niche a bit more. You might also want to check out the following lesson, for some more ideas. get access to the download files files. What item is this in relation to? Please contact us at our helpdesk, and we’ll be able to help you out! I would like to go back to the beginning, tip #1 and go through them. I have time to do so and hadn’t before this. Is it possible to do so and if so how do I find all of the posts please? Seam to me it is an XP program, would confirm to me that this Socratestheme is ok. Thanks much for understanding and your support! I originally set up a test page on my site: http://www.teamtravelgolf.com using the basic HTML language in lesson 29. Now I’m following your lessons on using WordPress for my site. When I published a page using WP, it doesn’t come up in my browser under my domain, but rather under a URL “teamgolftravel.com/wpkevin/…. What do I do to get the WP page as my home page without the wpkevin? You might want to do a re-installation. The next time you install, simply choose the root of your domain, as the installation path. One more thing. How do I get the HostGator icon off of my URL? When I go to teamgolftravel.com, it is always on there. The favicon.ico is the small icon that shows up near the search bar, representing your site. You could either delete or replace that file. I really appreciate all the great and understandable tips! I am amazed that I can understand most of the processes and it is written not to demean anyone’s intelligence. I am a newbie to web creation & blog (WP creation). I have been a Technical Writer for over 30 years in the electronic/ electricial/ mechanical industries primarily and I know how difficult it is to write to a blended audience. But you do a terrific job! I only occasionally need to research a term for further understanding. You really should write a book (& if you ever need an editor; I would love to help you). Anyways, thank-you. I am in the process of creating a website & a WP blog. I’m learning a lot & enjoying the process. It’s nice that you both have my back! God bless you; I wouldn’t have the confidence without your detailed & friendly style of informing!! Thanks for these great settings tips. WordPress is the best free platform out there.